1. Open the WACO Website (www.wacotitle.com) in Safari and tap the Action Menu symbol to access the available options. 2. From the Action Menu, swipe left along the bottom menu until you see the “Add to Home Screen” option. Tap this option. 3. Tap the “Add” option. 4. The WACO App will now appear on the Home Screen of your iDevice! 1. 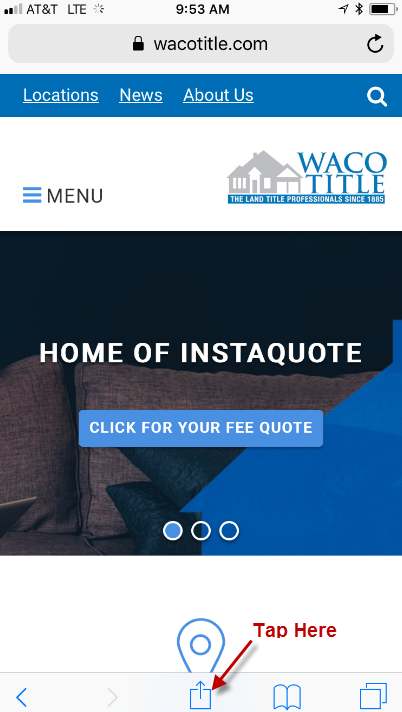 Open the WACO website (www.wacotitle.com) in the browser and tap the Action Menu icon to access the available options. 2. Tap the “Add to Home Screen” option. 4. The WACO App will now appear on the Home Screen of your Android device!